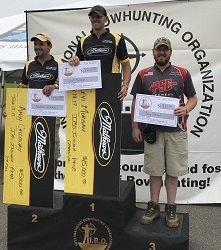 AMERICAN FORK, Utah - June 4, 2018 - Gold Tip and Bee Stinger pro shooter Levi Morgan recently won the first leg of the IBO National Triple Crown in Pipestem, West Virginia, capturing the podium of the Pro Release class and qualifying for the IBO National Triple Crown World Championship. Morgan won the event shooting Series 22 Pro shafts. Fellow Gold Tip pro Joby Shaw took second using his trusted X-Cutter shafts. The top three finishers all captured the podium shooting Bee Stinger stabilizer systems, with Chris Hacker placing third. Women’s Pro shooter—and last year’s Women’s Triple Crown overall winner—Erin McGladdery kicked off her 2018 season with a solid second-place finish. She was also shooting Series 22 Pro shafts. In the Semi Pro class, Gold Tip staffer Dale Jones landed another solid win with his Gold Tip X-Cutters.